High Quality Content by WIKIPEDIA articles! 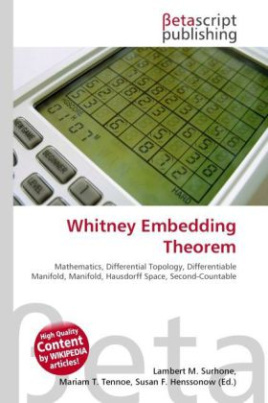 In mathematics, particularly in differential topology, there are two Whitney embedding theorems: The strong Whitney embedding theorem states that any smooth m-dimensional manifold (required also to be Hausdorff and second-countable) can be smoothly embedded in Euclidean 2m-space, if m0. This is the best linear bound on the smallest-dimensional Euclidean space that all m-dimensional manifolds embed in, as the real projective spaces of dimension m cannot be embedded into Euclidean (2m 1)-space if m is a power of two (as can be seen from a characteristic class argument, also due to Whitney). The weak Whitney embedding theorem states that any continuous function from an n-dimensional manifold to an m-dimensional manifold may be approximated by a smooth embedding provided m2n. Whitney similarly proved that such a map could be approximated by an immersion provided m2n-1. This last result is sometimes called the weak Whitney immersion theorem.